Trekking through the Atlas is definitely the fun part of my training for the Marathon Des Sables. In fact, it is so much fun I am beginning to wonder if it counts as training at all. Last week, I was around Sitti Fatma for two days with Noureddine Bachar, and as well as clambering over rocky high passes, I took the chance to try out my cooking system for the race. It got to lunch time and Nouri and I were pretty hungry. My meal of choice was vegetarian cottage pie. 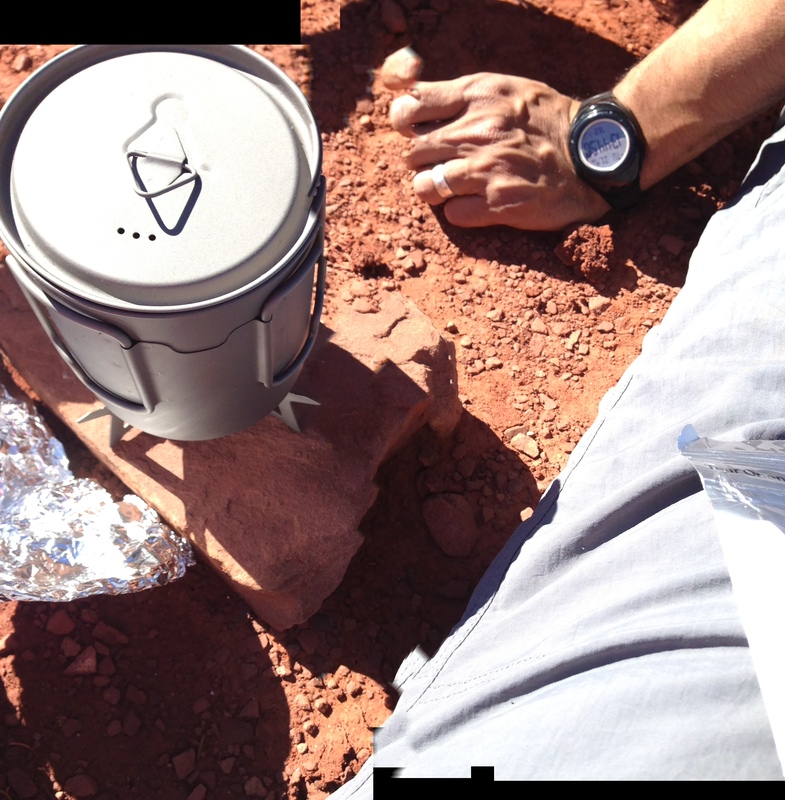 I whipped out my titanium pot/mug which takes 75 ml of water, enough for a cup of tea and to rehydrate a meal, and put it on the amazingly teeny weeny stove which is just three legs and a place for a cube of fuel. Two cubes of fuel should heat 75ml of water. The fuel lit immediately and all was going well. I forgot though, that water boils more slowly at altitude and we were at around 2,500 metres. So, the water wasn’t quite hot enough. I opened the packet and we had a look. It looked a bit like a beigey/grey porridge and smelt like pot noodle. Nouri gave me a look reminiscent of a scared camel but I was feeling pretty confident. I poured in enough liquid to cover the freeze dried food, stirred and repeated twice more, then I sealed up the bag and settled down to wait for 7 minutes. By the time I opened the bag, we had a very interested audience. Four little boys from the nearby village, had come up to keep us company and hang out. First impressions were not entirely positive. 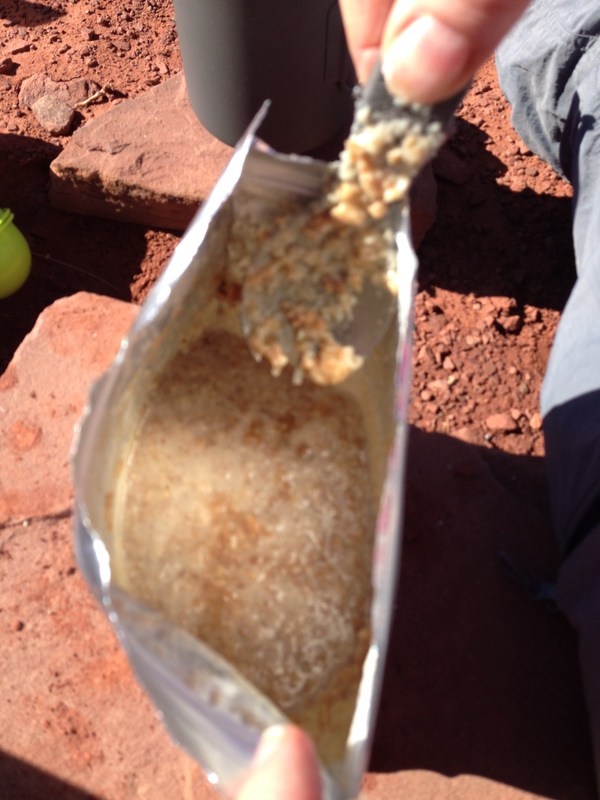 I heard a whisper….”It looks like diaorrhea!” Nouri was baulking so I took the first spoonful – sorry, sporkful. Admittedly it didn’t really look or taste or smell like cottage pie but it was fine. It just tasted very soya-y and the texture was mushy. I did my best “this is delicious” face, and passed the spork onto Nouri and the boys. Hilarious! One quarter of a spoonful each and they were rushing off down the hill making vomiting noises. I (wo)manfully ate another three spoonfuls to the admiration of the crowd and then admitted temporary defeat and Nouri broke out the bread and tuna, with little pastries for dessert. The boys were VERY appreciative of the pastries. But at 800 calories per 160 grams, it is Extreme Adventure Foods all the way for me come April 6th – although I might give the vegetarian cottage pie flavour a swerve.